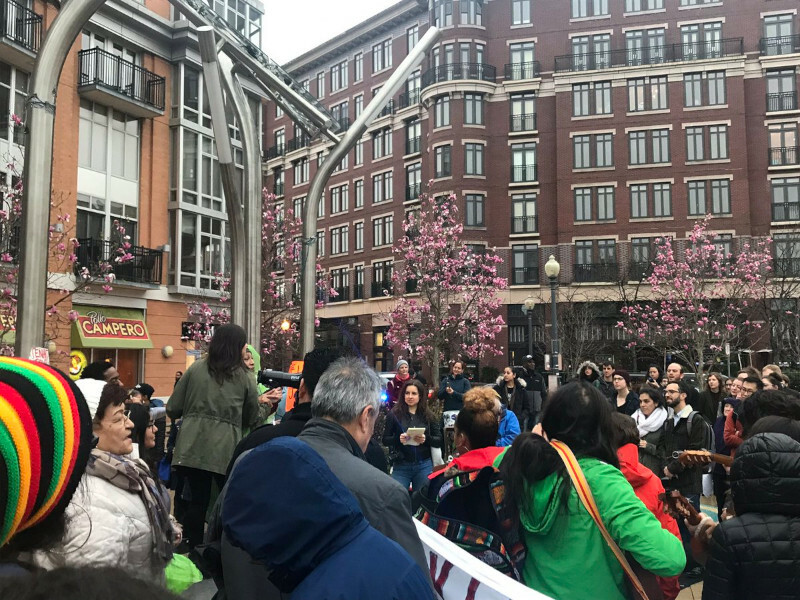 On the 23ed of April, the #DontMuteDC movement sparked by a single "New Washingtonian" attemting to silence go-go music at MetroPCS returned to 14th and U sts NW. 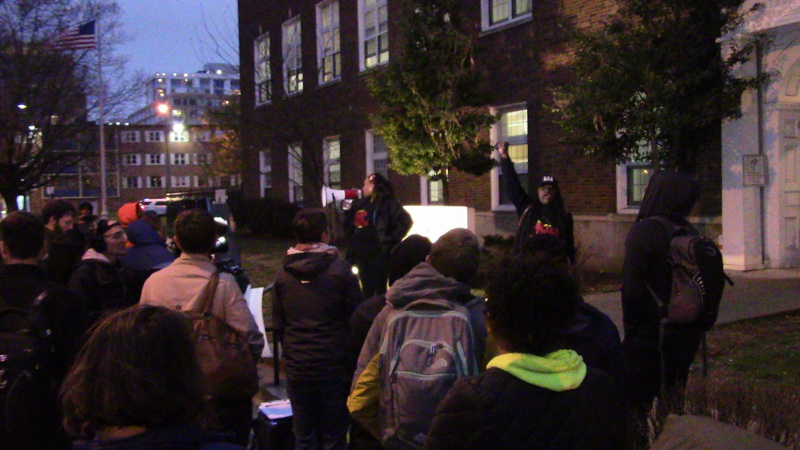 This time the protest had a new demand: fully funding DC schools in Wards 7 and 8. For the evening a touch of Anacostia was brought to 14th st as go-go music pumped and dirt bike/ATV riders showed up to cheers from the crowd. In recent weeks, white dog walkers from nearby condos have been literally shitting on parts of Howard University deemed sacred space by some students. Meanwhile, African-American dog walkers from neighborhoods near Howard generally do NOT walk their dogs at Howard according to the Washington Post. The hashtag "#HUisNotADogPark" has arisen on Twitter, and the push to remove the yuppie dog walkers from Howard has been tied to the succesful #dontmutedc campaign that restored go-go music to MetroPCS after a resident of the upscale Shay effectively ordered it stopped. 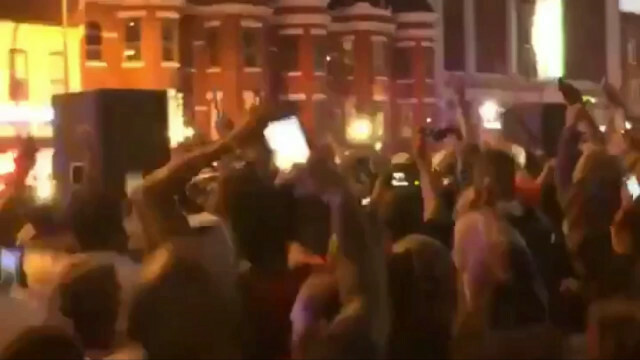 On the 9th of April, a huge crowd celebrated and danced to go-go on U st. What was to be a protest had become a celebration as the enemies of go-go threw in the towel and the music was back on at the 7th and FL Ave MetroPCS. On the 7th of April resident of the new Shaw luxury building known as The Shay threatened MetroPCS at 7th and Fl Ave with a lawsuit for playing Go-go music. T-Mobile also reportedly ordered them to stop playing the music, probably in response to the same complain from the same "New Washingtonian." On the 8th of April, supporters of Go-Go music held a protest at the MetroPCS store demanding they be allowed to turn the music back on. On the 5th of April rent-striking tenants of 1454 Irving St NW rallied at Columbia Heights Civic Plaza and then marched on 14th st.This was the second Friday in a row of these protests. Tenants are withholding rent in opposition to what appears to be an attempt at "eviction by neglect" with mold, broken heat, and pest infestation intentionally not repaired. The landlord has made it clear he wants the tenants OUT. Many have been there since the 1970's and the surrounding area has been gentrified. 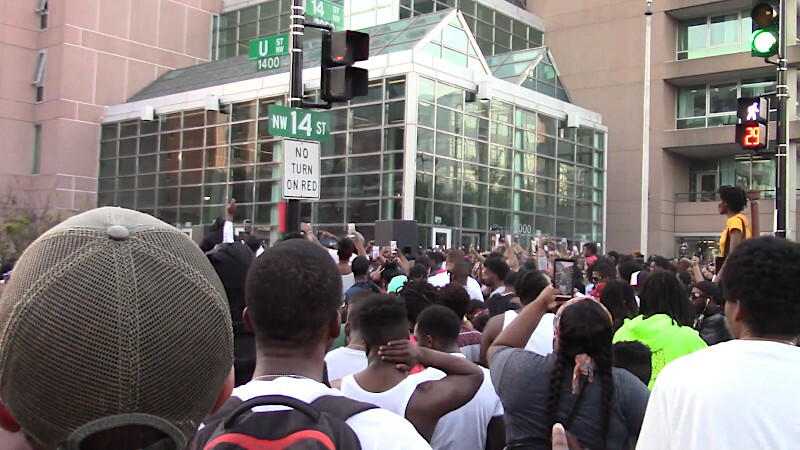 On the 5th of April, Black Lives Matter showed up outside MPD's First Division headquarters at 1st and M sts SW. 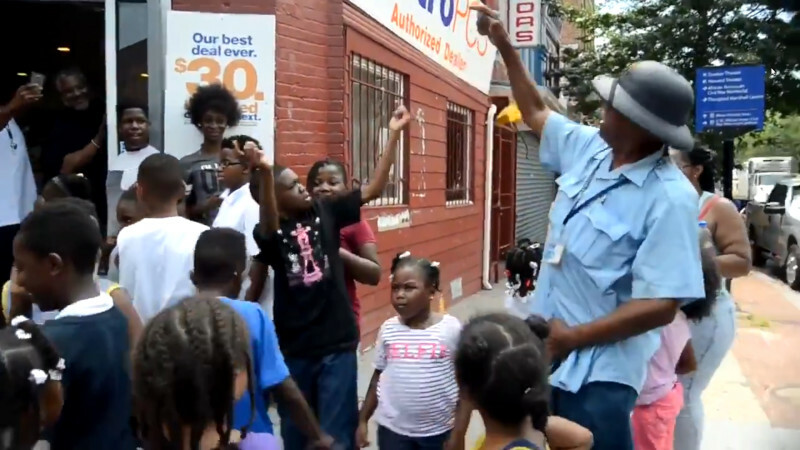 They were there to protest the normalization of Black kids as young as 11 being subject to arbitrary detention, Stop and Frisk, and being handcuffed. MPD claims these are isolated incidents, Black Lives Matter says otherwise and has the testimony and accounts by parents to back it up. On the 18th of March, DC's Mayor Muriel Bowser held her annual State of the District address. 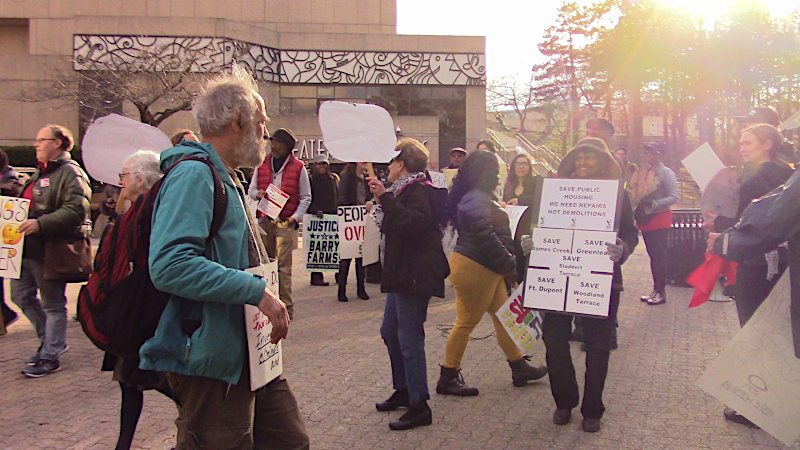 Outside, protesters demanded she spend money on public housing instead of corporate giveaways and halt "redevelopment" projects that displace low income residents and give public land to private developers. On the 16th of March, the Arlington County Board met to discuss a multi-million dollar giveaway to Amazon and Jeff Bezos for HQ2, possibly the richest man in the world. Protesters disrupted the hearing, calling affordable housing and similar priorities more important than Amazon. Disregarding the public dissent, the board voted to approve the funding package by 5 to zero. Update 3-17 11:26PM:There is a report that Amazon may end up quitting Northern Virginia as they gave up in NYC, apparently they fear the wrath of the people more than bought-and-paid for politicians do. Update Jan 22: DC Council overrides Mayor's veto, fare evasion will be decriminalized unless Congress intervenes. Mayor "more cops more jails" Bowser defeated again. On the 16th of January, DC Mayor Bowser VETOED the Metro fare decriminalization bill. The bill passed the DC Council by a 10-2 margin, enough to override the Mayor's veto if nobody changes their vote. Metro police have been aggressively targeting Black youth for enforcement and arrest on fare evasion charges. This could perhaps be called "Make Metro White Again.